Nurture future artists and Support Women Artists Now with a creative activity for creators of all ages. 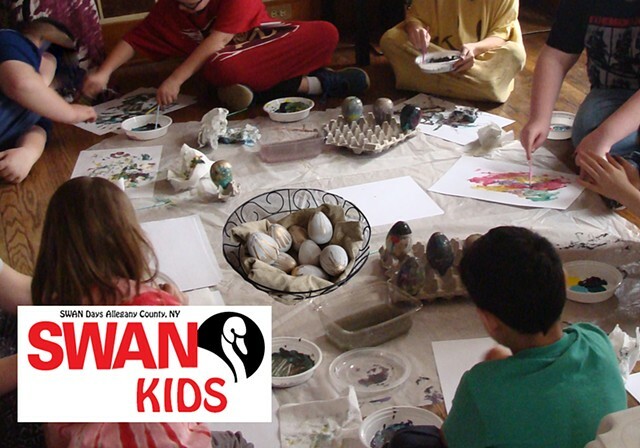 SWAN Kids lists and provides numerous assorted affordable creative projects for area youth. New Activities welcome! March 11th Noon-2pm Spring Fling Wreath-making class (Ages 3 and Up). March 28th 4pm at Alfred Box of Books Library~Inspiring Girls and Boys to Dream Big~ "Good night stories for Rebel Girls; 100 Tales of Extraordinary Women". SUNY Alfred Women Engineers are Pioneers (WEP) Club will be holding a Good Night Stories for Rebel Girls storytime, with stories from the best selling book! Each participant paints a papier mache "SWAN Egg" to take home. CONTACT the studio to RSVP BY March 23rd. April 4th Noon-3pm at the studio. Paper Recycling Project. Up-cycle junk mail and used paper in this basic introduction to recycling your own paper and make a craft project from recycled paper to take home. April 6th ~Noon-4pm Draw, Paint, & Play Party~ $10 (Ages 7 and up) Offering a mix of guided and independent creative activities with 10” x 10” canvas and other supplies to Art & take home.Limited seats available.Pay & Pre-register by March 23rd 2018, at the studio or CONTACT the studio and Pay Online Now.